Using a mixer or pesto mortar, just add caffeine pills, cinnamon and the black pepper and transform them into a powder. Mix very well all the ingredients with the ginger and the turmeric. For making the tea, just add half tea spoon of this tea with hot water and if you like to drink tea with a little bit of milk like me add a little bit of milk with it. Piperine is also used as an analgesic cream that can be applied topically on the skin to relieve pain. Curcumin has been studied for its anti-inflammatory capabilities especially in the treatment of rheumatoid arthritis, ulcerative colitis and other inflammatory conditions. However, long term use can cause serious side effects. Hence, safer alternatives like curcumin are being studied for their potential anti-inflammatory benefits that can be used long term without any side effects. Dietary polyphenols like piperine and curcumin have been studied for their effect on prevention of breast cancer. Mammosphere formation, which is a marker of breast stem cells were studied. Early progenitor cells, normal stem cells and healthy breast epithelial cells were examined after control, piperine and curcumin treatment was administered. In a University of Michigan study, cancer cells were injected with a potent solution of piperine and curcumin that was at least 20 times stronger that what is normally consumed through food. This is considered a significant development. Further both compounds did not affect normal breast tissue. Sometimes women who are susceptible to breast cancer maybe advised to take medications like tamoxifen. However, these can be toxic. Natural compounds, which offer similar benefits and are non-toxic, could be a safe alternative therapy. Another benefit is that piperine and curcumin target self-renewal of all stem cells and not just those that are estrogen sensitive like tamoxifen. This theory offers hope to all women who develop breast cancer not just the estrogen driven kind. 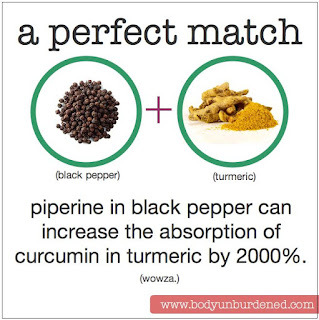 Turmeric and black pepper could be combined to fight high cholesterol levels, obesity and diabetes. Diet induced bodily changes to blood glucose, body weight, low-density lipoprotein (LDL) or bad cholesterol and triglyceride could be affected by CPQ. CPQ is an acronym for the combination of curcumin, piperine and quercetin (got from onion skin). Presence of flavonoids in CPQ is possibly responsible for many of the reactions like decrease in glucose transport. These studies were conducted on laboratory rats. This is due to the capacity of curcumin to prevent growth of Helicobacter pylori bacteria which causes peptic ulcers and the protective capability of piperine. Hence, they can benefit in improving memory loss and protect people from cognitive impairment from neurodegenerative diseases like Alzheimer’s. Curcumin has anti-amyloid ability that can reduce amyloid pathway in Alzheimer’s. Both low and high doses of curcumin fed to laboratory mice seemed to reduce age-related memory loss. The dosage of turmeric varies depending on the medical condition. As with most herbal supplements turmeric has no specific dosage guidelines. 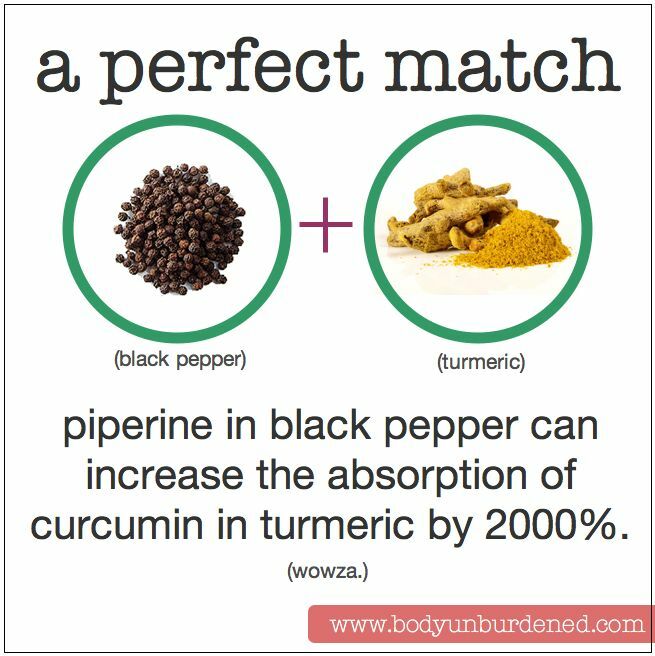 As I keep saying again and again, I am not in favor of turmeric supplements and support using turmeric in your diet. Use supplements only in cases when you cannot do so. Black pepper too can be easily added in your diet in curries, salads and dressing. While both turmeric and black pepper are considered very safe and have been used since thousands of years, if you suffer from some specific medical problems and are not sure about using them, please consult your doctor.